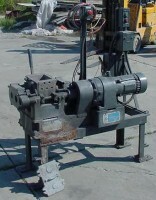 5 gallon Double Arm Spiral Blade Mixer, Pilot plant size. 30 cu ft working, Paul O. Abbe Dbl. Cone Blender, rubber lined. 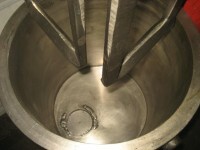 2 gallon Planetary Vacuum Mixer, stainless steel, jacketed. 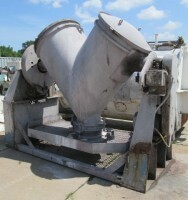 25 gallon Ross Double Planetary Mixer, stainless, vacuum. 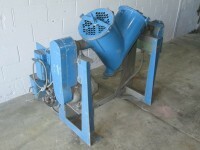 used 150 gallon Ross Double Planetary Mixer, stainless steel. 150 gallon Ross Mix Can, stainless steel, jacketed, casters. 15 cu ft Double Ribbon Blender, rubber lined trough and ribbon. 20 cu ft Stone Equip. Corp. Paddle Blender. 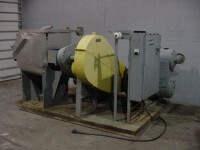 55 cu ft Ribbon Blender, 304 stainless steel contact parts, 20 hp. 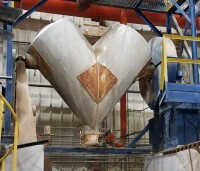 210 cu ft Sprout Waldron Double Ribbon Blender, jacketed. unused Eirich R15 Pan liner, bottom and sides. Four(4) Eirich Mixing Blade Arms. Eirich lip Seal, for DEV22 mixer. 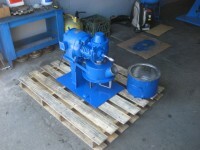 5 hp Hydraulic Pump, for Eirich discharge door. J.H.Day Mixtruder, Dbl. Sigma Blade with extruder discharge. 8 qt. Patterson Kelley Lab Twin Shell Blender, stainless steel. 8qt. P-K Twin Shell Lab Blender, lucite shell. 10 cu ft Brighton Twin Shell Blender/Cooker, stainless steel. 30 cu ft Patterson Kelly Twin Shell V-blender. stainless steel. 40 cu ft PK Twin Shell Blender, carbon steel epoxy lined, with bar.